Ghosts and Zimbabwe: What caused the haunting? Friends of ours lived in a farmhouse in Glendale - north of Harare. The house had been the original church and so had a number of interesting features including a very high ceiling to the main drawing room. there were also many antiques including the picture shown here. We would go for long leisurely lunches - which often became quite noisy and full of fun. However as soon as one entered the house one felt a coolness and feeling of uneasy in the main drawing room. 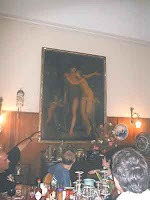 Was this the atmosphere of the house - or was it something to do with this picture? No one seems to know where it originated but sometimes it seemed bright and full of light at others dull and uninteresting. The house is reputed to be haunted - was it the memories of the church or was it something to do with the picture? Who knows! Both are now gone. Over the many years I have lived in Africa I have never found so many sightings of the paranormal as I have here in Zimbabwe. During the seventies my husband and my father became ghost hunters and I will be recounting some of these stories. I would love to hear from anyone with stories about the supernatural from this country or elsewhere in Africa. Get the THE PARANORMAL CASEBOOK widget and many other great free widgets at Widgetbox! Get the Fantasy Ecards - Greeting Cards Widget widget and many other great free widgets at Widgetbox! Get the Magic 8 Ball widget and many other great free widgets at Widgetbox! Get the Odd America widget and many other great free widgets at Widgetbox!